The Model SXR-64A is a 64-channel, 8-zone, supervised wireless receiver/annunciator designed for use in residential or commercial security systems. Housed in a rugged metal enclosure with a high-gain receiver, the SXR-64A connects to a hardwired alarm control panel adding wireless capability to the panel. The unit’s eight alarm zones and four supervisory outputs provide a flexible interface. Any or all of the zones can be used. 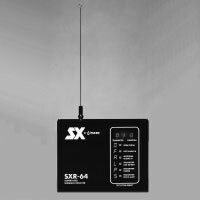 The SXR-64A receives signals from a variety of security transmitters then processes, displays and transfers the signal to the hardwired alarm control panel. Six unique conditions for each transmitter can be shown on the unit’s display. Conditions such as Open Portal, Transmitter Low Battery, Transmitter Tamper and First Alarm In show the status of each transmitter in the system. Valuable features such as Alarm Memory and Transmitter Status allow for quick system diagnosis and troubleshooting. All of the solid state zone outputs can be either normally open or normally closed electrical configuration and can switch up to 100 mA @ 24 VDC. Operating Current: 200 mA max.